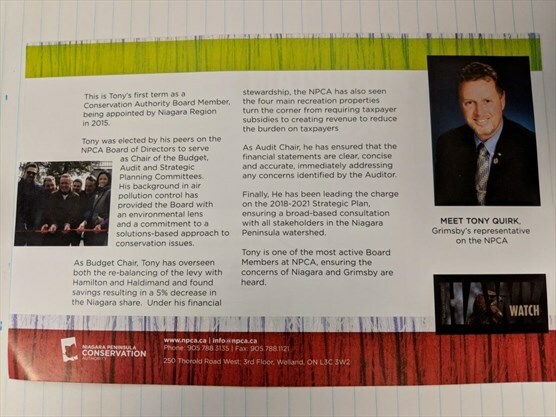 As we wrote in our previous post here, there has been some controversy as to whether flyers from the NPCA that featured a full-fledged bio of Grimsby’s Regional Councillor may be considered campaign material. Councillor Quirk has already filed his nomination paperwork for re-election, pending certification. Regional records show Quirk has spent more than $2,460 of public funds on regional flyers, flyer deliveries, newspaper ads and other information and promotional materials in the first quarter of 2018. No other regional councillor has similar claims listed in their expenses. Grant LaFleche of The St. Catharines Standard has done a great job with his article pointing out all the inconsistencies (and silence) coming from the NPCA and Councillor Quirk. It seems their answers raise even more questions in a classic he-said/she-said fashion. Here We Grow Again: Winery Inn Sold, Two (Proposed) High Rise Towers Coming Up!